As collections manager at London's Natural History Museum, Max Barclay has traveled the world in search of rare and previously undiscovered insects. So when his five-year-old son took a break from a picnic lunch last year in the Museum's garden and returned with an insect in hand, Barclay could not have guessed that his question  "Daddy, what's this"?  would lead to a global detective hunt that has so far stumped Barclay and the world's other entomologists. Despite working with an insect collection of over 28 million specimens, Barclay and his colleagues at the Natural History Museum have been unable to identify the almond-shaped insect, about the size of a grain of rice, that has in the past year made itself at home in the sycamores trees on the 19th-century museum's grounds in central London. "My field work has taken me all over the world  to Thailand, Bolivia, Peru. So I was surprised to be confronted by an unidentifiable species while having a sandwich in the museum's garden," Barclay says. 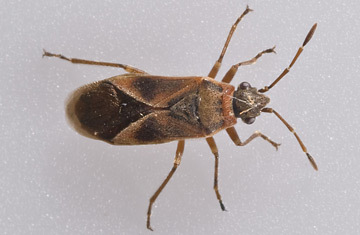 Several months of research led Barclay to discover that the insect, which resembles the common North American box elder bug, is actually most closely related to to Arocatus roeselii. But that European bug is also associated with alder trees rather than sycamores. An insect specimen found in Nice on France's Mediterranean coast, which is now in the collection of the National Museum of Natural History in Prague, turned out to be identical to the mystery London bug. But that specimen, it turned out, had been misidentified as Arocatus roeselii. "There are two possible explanations," says Barclay. "One is that the bug is roeselii and by switching to feed on the [sycamores] it has suddenly become more abundant, successful and invasive. The other possibility is that the insect in our grounds may not be roeselii at all." In recent years, several new insects, spiders and beetles have been discovered in Britain, a trend many attribute to the ability of these species to survive winters warmed by climate change. In 2005, Edinburgh Zoo issued a public notice after several panicked Scots reported a non-venomous spider called a "false black widow" that had a disconcerting behavior of rushing towards people who approached it. The spider turned out to be quite common  in the Canary Islands. Barclay is not convinced that climate change is responsible for these new inhabitants. "It's very difficult to judge because the period of time we have seen global warming potentially influencing the insect fauna is almost exactly the same period of time since the [European Union] opened up its trade barriers between member states. So in the last decade and a half we've been importing a lot more from Italy and Spain and Southern France and we've had this climatic change  so we have two potential causes." Whatever the reason for the appearance of the mysterious new bug in London, Barclay says its rampant spread around the city is harmless. However, "it does show what's possible [if more damaging species invade]." The struggle to identify the critter displays not only the mystery of nature, but also the fickleness of the science of taxonomy. Identifying insect species can be extremely difficult; some scientists estimate we have managed to identify only 10% of the insect world so far. The rest, like Barclays' almond-shaped mystery bug, are perfectly happy to crawl along without any christening or approval from their relatively gargantuan cohabitants. But that won't stop scientists like Barclay from trying. For him, the question asked by his five-year old son last March is a calling he still feels compelled to answer.